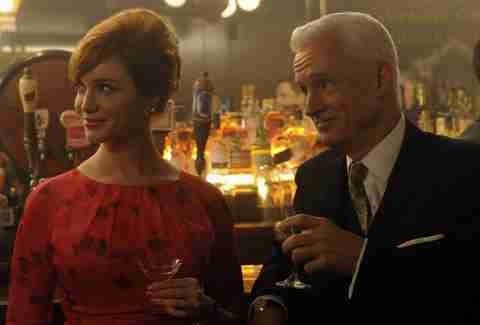 There is no disputing the fact that the characters on Mad Men enjoy their casual and not-so-casual boozing. From three-martini lunches to, um, literally every single situation, at least one character (or all of them) has a drink in hand, and it’s not going to be the last. But some characters are just not as talented as others at handling their alcohol (looking at you, Freddy Rumsen). 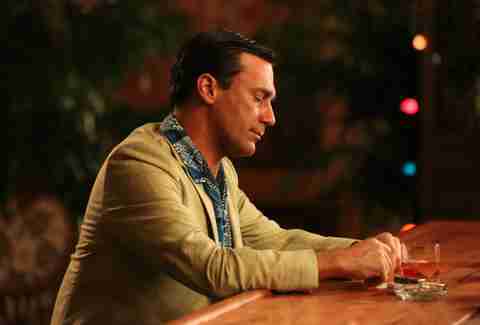 With Mad Men’s final season premiering this Sunday, and in an effort to curb our mourning, we poured ourselves six or seven martinis and ranked the characters from the worst drinker to the best. Poor Freddy... there’s something oddly lovable about him, despite the fact that he is wildly sexist, and really, really terrible at handling his booze. When we first meet him, he’s drinking a hefty glass of vodka and orange juice for breakfast, and informs the others, "A day without orange juice is a hell of a long day." Fast-forward to season two: they’re about to meet with Samsonite, and Freddy abruptly stops talking and just completely pees his pants. And then passes out. And gets put on leave. The worst part is, he doesn’t even notice that he's peed himself; Pete has to point it out. By season four, Freddy's sober -- albeit still every bit as misogynistic. Oh, Don. He’s been able to land deals after three- or five-martini lunches. In season six -- after several drinks -- he even convinces rival firm CGC to merge with SCDP in order to sign Chevy, which they were about to lose. But also, let’s not forget when he vomits all over Roger’s Mother’s funeral. Or when he wakes up with a random waitress he doesn’t even recognize after a post-CLIO Awards bender. Or when he punches a minister in a bar. Duck, like Don, just has a very real issue with indulgence. At the CLIO Awards in season four, he harasses the emcee in front of the entire room and is promptly escorted out. Peggy later confronts him about his over-drinking, and he admits he has a problem (okay!). But then he drinks and calls her a whore and tries to punch Don (who is also a few drinks in). As of season seven, however, he is sober. 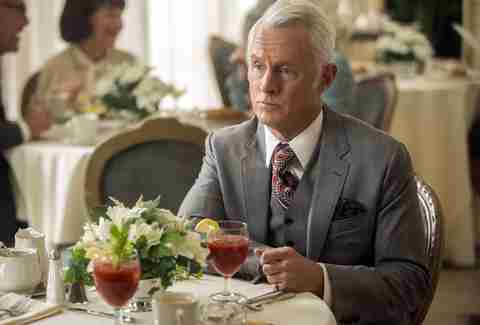 When Don Draper and Roger Sterling are cringing at your behavior, that's probably the right call. 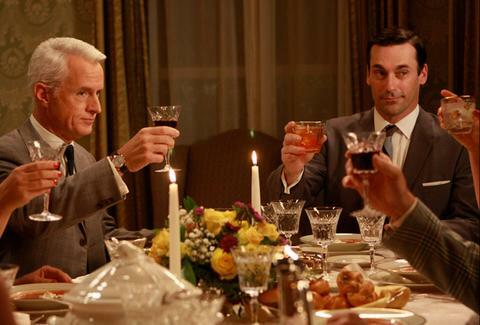 In season one, Roger tells Don, "You don't know how to drink. Your whole generation, you drink for the wrong reasons." But Roger isn’t exactly the Michael Jordan of responsible boozing either. Don gets his job largely because he and Roger go out for drinks at 10am. For pretty much all of season five, Roger is a complete mess -- drinking all day long, showing up to the office disheveled (remember the Hawaiian button-up over his dress shirt on Pearl Harbor Day? ), and we’d be remiss not to mention that LSD incident. We’ve also seen him barf magnificently in front of clients -- but, in his defense, it was because Don set him up to drink a ton and then take the stairs to get back at him for hitting on Betty. 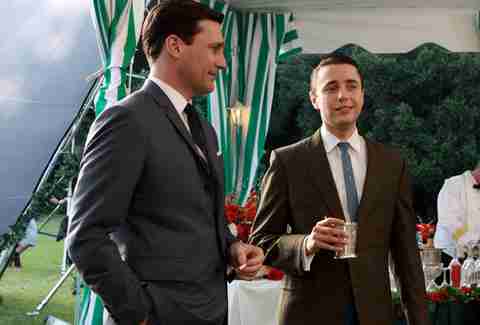 Throughout the entire series, Pete Campbell is just a serious a-hole, sober or not. Perhaps most memorably, though, after his bachelor party in season one, he shows up at Peggy’s apartment barely able to hold himself up/speak (she lets him in anyway, but let’s not touch that one). Harry’s a big drinker. But are we concerned about him? Not deeply. In season one, we see him inexplicably roaming the office in his underwear at night, holding his trash can -- which he has accidentally lit on fire via a cigarette (it could happen to anyone) -- and then entering a spontaneous pitch meeting with Don, still in his underwear. RIP Lane. We’ll never forget that one time you had a "boys' night" with Don, put your steak at your crotch, and yelled, "I got a big Texas belt buckle! Yee-haw!," and then slept with a prostitute. Betty generally knows how to handle her vodka gimlets. In season two, in a move that almost makes us regret ever disliking her, she finally stands up to Don, telling him she "knows what kind of man he is" (read: one who cheats on his wife and is generally a pretty terrible guy, but yeah, is pretty good at advertising). She then falls asleep in a big polka dot dress, and spends the next day drinking red wine, still in said dress. After rifling through Don’s stuff for evidence of his philandering and passing out midday, she wakes up a bit haggard. She gets a pass for this, though, because it was about damn time. Megan is a big red-wine drinker, and for the most part handles her alcohol just fine. Did she do 10,001 shots before that “Zou Bisou Bisou” performance? Who knows. We certainly had to drink while watching it. Never forget. Joan is a beautiful, powerful, unicorn goddess that can hold her alcohol (the like, three times she has drank on the show) better than practically anyone. Think about when she and Don go out day drinking in season five after she receives her divorce papers, and Don is sitting there with his ridiculous tilted hat, trying to get her to dance with him. Joan remains totally poised and put together. Joan is probably the type that has to say "Guys, no, I literally can’t have anymore. I’m already 10 drinks in,” because no one can tell. Trudy’s got things under control. 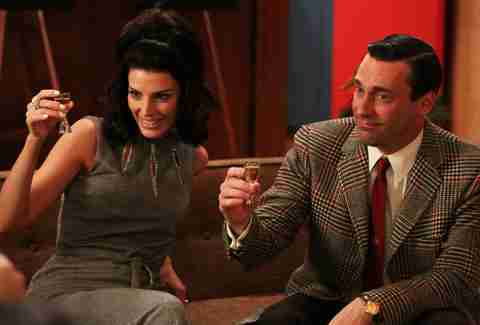 If we had ever been married to Pete Campbell, we'd be drinking 24/7. Bert, before sadly passing, was not a big drinker, but he’d have a brandy every once in a while. 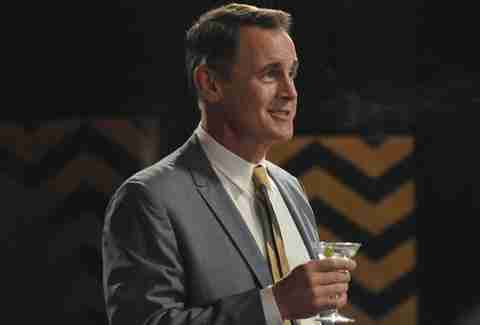 In season six, after revealing to Pete that they've won their proposed IPO price of $11 a share, Bert requests a drink: either brandy, or spirits of elderflower. Pete has neither, because he's Pete. Bert was also the one that enforced order and productivity (and Zen!) in an office full of people who cannot handle themselves. Also, he can ghost-dance better than anyone (we would assume). Peggy, without question, is the best at drinking on this whole damn show. Especially as she moves up at the firm, she consistently drinks during and after work with the rest of SC&P -- yet she still gets things done. While the men are consistently sloppy, Peggy drinks like a champ. Have we ever seen her throw up? Pass out? Pee herself? No, no, and no. 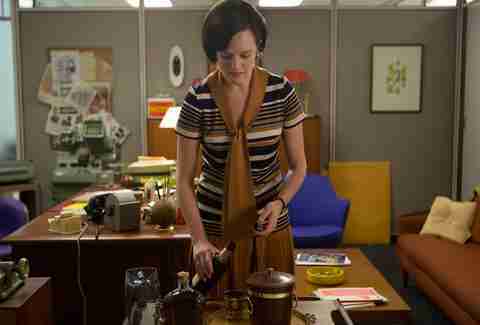 Yes, there was the whole "I’m Peggy Olson. I want to smoke some marijuana," thing, but like, bless her heart (and also, she comes up with an idea for Bacardi after smoking, while Smitty and Kinsey have nothing). She puts it best herself in season five, when she says, "Am I the only one who can work and drink at the same time?" while swigging a beer. Yes, Peggy, yes you are. Lucy Meilus is a Cities editorial assistant at Thrillist, and has been steadily drinking since 2012 in an effort to get "Zou Bisou Bisou" out of her head. Sympathize with her: @Lucymeilus.